Wise Auto Shutdown enables you to set the PC to shut down, restart, power off, log off, sleep or hibernate on a regular basis or only once, at a specific time. 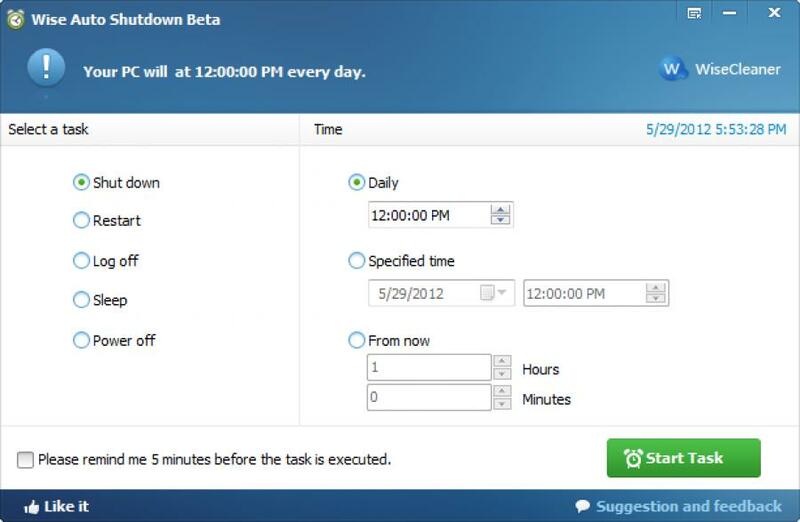 Wise Auto Shutdown lets you schedule a task to be executed on either a daily basis, at an exact time, on a certain date and time or after an amount of time has lapsed. After you start the task, it will run in the background and a double-click will get the main interface back from the tray to the desktop. It will remind you of your choice five minutes before it carries out the automatic task. Interface of Wise Auto Shutdown can’t be any simpler. There are no menus, no complicated options or dialog boxes. Wise Auto Shutdown gives Windows users more power and options for controlling their computers.